Free shipping – no matter how big or small the gift, everything ships to the couple for free! Extra 10% off – For up to 6 months after your big day, you will receive a 10% discount on everything left on your registry that was no purchased. 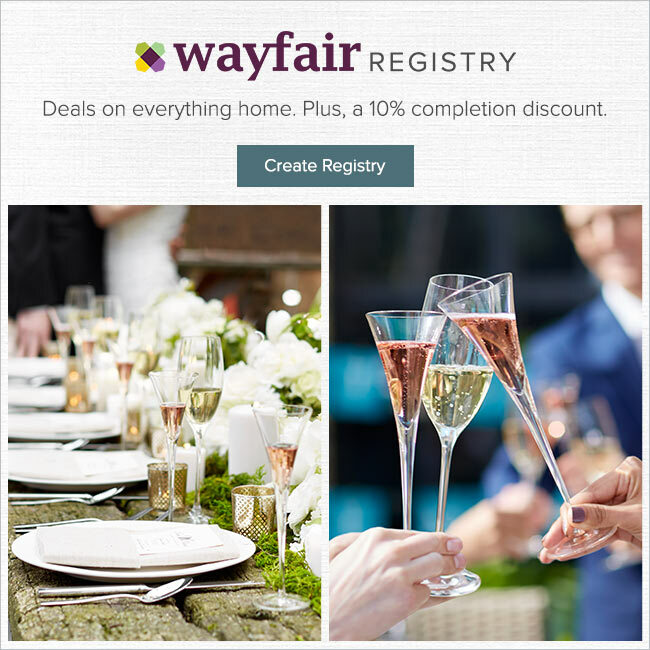 Customizable checklist – Wayfair really has everything you need for your new life together, and their customizable checklist helps you to be sure you register for everything needed. Group Gifting – Multiple guests can chip in together to purchase some of your bigger wishes on your list. Free Returns – If you receive a wedding gift that you had on your registry but decide you do not like or need it, you can return it for a store credit for up to 90 days after your wedding date. Registry specialist are there to help you! – Registrants and their guests receive personalized support and guidance from the Wayfair specialists. This post contains affiliate links and SnapKnot will be compensated if you make a purchase after clicking on links.